Smoked Oysters are naturally smoked, and are of uniform size and color. As one of the largest importers of smoked oysters in the world, we are able to source only the highest quality of oysters available. Each and every production code is pre-approved prior to shipment. This ensures that our high quality standards are maintained. Boiled Oysters are packed in water using only whole oysters. As with our Smoked Oysters, we pre-approve all production codes prior to shipment. 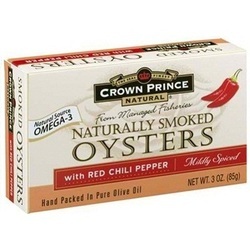 These Boiled Oysters have a clear, clean appearance and taste without any sand or grit. Try Boiled Oysters in stews and chowders.